The Temple and Cemetery of Confucius, and the Kong Family Mansion are three important sites in Confucianism. They are located in Qufu, Shandong Province. Together with the Summer Palace in Beijing and the Mountain Resort of Chengde, the Temple of Confucius in Qufu is one of the three largest ancient architectural complexes in China. East of the Temple of Confucius, is the Kong Family Mansion. Kong is the family surname of Confucius and his descendants. Confucianism has had the most enduring and profound effect over Chinese culture. As time went on, Confucius became respected as a sage, and the temples to Confucius were built as a landmark for all of China. Among them, the Temple in Qufu, the hometown of Confucius, is the most famous and the largest. Getting to the little town of Qufu is quite a trek into the countryside for what is only a mildly interesting WHS. Visiting is pretty organized here, as the temple, family mansion and cemetery of Confucius are conveniently lined up after each other and share one entry ticket. I decided to go my own way, and started at the middle (at the mansion) and skip the cemetery. The grounds of the temple and mansion are full of 'Chinese things'. I bought a booklet about those traditional Chinese culture items a few weeks ago, and could tick off quite a number here: door studs, scenic openings (jingdong), stone turtles burdened with stone tablets, zoomorphic ornaments, glazed tiles and a strange ornament that might be Taihu rockery. The best sight of them all is at the rear of the Confucian Temple. The 18th century Dacheng Hall has ten wonderfully decorated columns, ornamented with dragons. Although I do not contest its place on the World Heritage List (it certainly has invaluable historic value for northeast Asia), there's not much here which can't be seen elsewhere in China. I can only recommend a visit for those with plenty of time on their hands or studying Chinese culture. What did I think of this WHS? It's very interesting if you are into the history of Confucius and maybe Mencius (just 30 minute by taxi away). 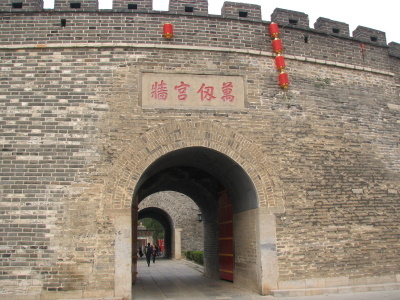 Even the birthplace of the Yellow Emperor and the tomb of his son are in current QuFu. The temple and mansion are nice to see but not for a first timer in China. For die hards, the Mencius temple is smaller and less interesting. I did go, just to go and see it. But I would not recommend to most visitors. Qufu is however a great place if you are traveling the Beijing-Shanghai railway. A nice stop here for a night is worth it. Photos please see the link below. I really enjoyed my time in Qufu. While this small city is fairly off the tourist map, the Family Mansion of Confucius can get very crowded (like most China WHS). Luckily, my Chinese friend had family in Ti'an, close to Qufu, so we had an early start. The complex itself is full of classic Chinese motifs. If you have already visited many Chinese style homes or palaces, it might loose some of its draw. However, I found it fascinating, the veneration of this family from the time of Confucius, lasting until the Qing dynasty (77 generations). The courtyards are spacious, lined with trees. The buildings are decorated, in some occassions, in the same style only reserved for the Emperor. Like others have mentioned, some of the stonework, such as exquisite pillars are worth taking note of. For those who want solitude and space from the tour groups, take a stroll in the cemetary. In these burial grounds you will find countless tombs of the Kong family. 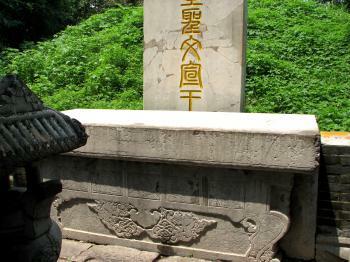 Deep into the cemetery you will find the tomb of Confucius himself. There is the incredible fact that this cemetery contains the burial remains of more than 100,000 of his descendants! While the tomb itself is far more recently built than the 5th century BC, it is a great place for reflection and people watching. You might be suprised to see the lighting of incense, kowtows to the great sage, and even flowers being left in front of China's most famous philosopher. I traveled from America in 2009 with 15 educators to study Confucius. Qufu is almost a holy spot for the sage. Climbing Mt. Tai and seeing Chinese tourists visit this place made us realize how Confucius' philosophy still has a strong hold on the modern Chinese. This is a country of very strong contrasts. Farm houses with solar panels, old men on cell phones (they skipped the phone infrastructure). If you are a tourist coming for cheap pearls don't bother coming here. If you are a person who is truly interested in learning about another culture (in Qufu women pedal cabs and make $3 a day) then this is a place you should visit, after Shanghai or Beijing. For anyone coming from the West, this would be a place of little interest, except s/he has stong interest in Oriental culture. Confucious, arch-man of the Kong Family, is an anicent philosophy who contributed tremendeously to the Chinese culture, evening including cultures of Korea & Japan. That's the tip! Little to do with Communist. I and a friend stayed at the Kong Famly Mansion in 1990, when it was a reasonably-priced hotel for foreigners. We were two American women, surrounded by Japanese men visiting then for the Confucius Ceremony. We were travelling independently, using the LET'S GO series book, and it told us to go there. We needed no special permission. I remember distinctly how yellow the water was in the bathtub when it came out, and we decided against having a bath. The foot-high room dividers were a major problem because we also climbed up Mount Tai, slept overnight there, then hiked back down the trails on its opposite, well, back side. We could barely move our legs at all!!! The Japanese just laughed at our stiff, awkward attempts to get over these dividers. I still wonder what the point of such divisions between the rooms was. Qufu was packed with visitors. Mount Tai was quiet in terms of foreigners... we were the only ones climbing up. I am happy that we did it then, when I see that it is now a museum. No mention of what happened to the Kong family? Murdered by the Communists? Fled? Flied?